Since 2008, the UWAA and BECU have been partners in the idea that investing in education and excellence strengthens the UW, the Puget Sound and the world at large. 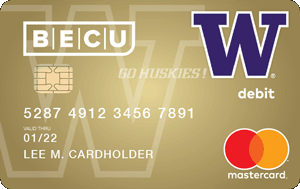 The official credit card of the University of Washington. 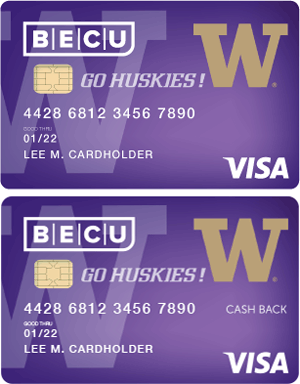 Show your school pride every time you pay: BECU is proud to offer the official credit card of the University of Washington. Represent the dawgs while receiving the same great benefits as our BECU Visa or BECU Visa Cash Back credit cards. A debit card worth its weight in purple and gold. With the UW Gold Debit MasterCard, you can reinforce that commitment to community with every purchase you make, while enjoying a truly free checking account with no minimum balance requirement, no monthly fees and the peace of mind you deserve with fraud monitoring protection.